We work directly with teachers and educators to craft the ideal tour to complement your current curriculum. School tours—particularly those abroad—provide numerous benefits for both students and teachers. Textbook learning comes alive when students interact with the sights, sounds, and people that they’ve previously only read about or discussed in class. Students translate the statistics of history lessons into a tangible understanding of what has happened, and why. They become more culturally sensitive, develop a deeper understanding of the context of their learning, and grow in confidence, independence, and empathy. School tours provide the opportunity to experience curriculum in a way that is meaningful, interesting, and long-lasting. Teachers find that school tours help them develop better rapport with their students, enhance their teaching skills and future classroom work with hands-on learning, and find professional development benefits. A school tour gives teachers the confidence to explore Vietnam and Cambodia with their students in tours designed with their student’s needs in mind. Our history tours in Vietnam and Cambodia are linked directly with what your students learn in school and in their textbooks. We reinforce critical information while providing them with a variety of learning opportunities designed to give a deeper understanding of the history of these countries. We give the students meaningful first-hand experiences, such as meeting soldiers through workshops and Q & A’s. History really does come alive for students when they interact with those who lived through it. The Vietnam War is a big part of Australian and US history, and through our history tours, students are given unique connections and understanding of this important time. We depart today for our flight to Hanoi. Upon arrival we transfer to our hotel. Today we set off to the ‘Jewel in the Crown of Vietnam’; Halong Bay. With two well-defined ecosystems and spectacular scenery formed over millions of years of geological activity, it is easy to see why Halong Bay was voted one of ‘The New7Wonders of Nature’ in 2011. Beauty aside, Halong Bay was also one of the cradles of the ancient Vietnamese peoples and the area maintains many cultural and historical values which are unique to this region. Arriving before lunch we will board our private boat and then set sail, cruising amongst thousands of extraordinary limestone karst formations. After dinner, we can try our hand at catching some squid with the friendly crew or entertaining our friends with a spot of karaoke before retiring to our room onboard for the night. This morning we watch the sun rise over the bay before we disembark and transfer back to Hanoi. Along the way we stop at a local village to partake in Vietnam Eco Adventure. Our time at this quaint little village will allow us to experience a farmer’s traditional way of life as well as gaining insight into how this traditional community is responding to environmental change. Today we will explore the village on the back of a bike before getting our hands dirty and having a go at farming using methods utilized by northern farmers’ for centuries. Our group will also have an opportunity to enjoy fishing and crabbing using traditional Vietnamese nets, boats and equipment. After lunch we will have the unique opportunity to speak with former soldier Mr Vu. Born in 1948 Mr Vu was a part of the best division of ‘Northern Liberation Force 308’; a group of smart and well trained soldiers who successfully fought and survived 3 of the biggest operations (1967, 1968 and 1972) during the war. A wonderful man Mr Vu holds some amazing primary insight into Vietnam’s tumultuous past. Following this we will visit the infamous Hoa Loa Prison Museum which is also known as the ‘’Hanoi Hilton’’ and was where former US presidential candidate John McCain was incarcerated for over 5 years. Later this afternoon we enjoy an early dinner before we make our way to the airport for our short flight to Hue. This morning we set off for the Ancient Imperial Citadel where we will explore the impressive architecture and the luxurious lifestyle of its former residents. Next we transfer to the Thien Mu Pagoda and the Ancient Royal tomb of Minh Mang before enjoying a scenic boat trip along Hue's Perfume River. Today we make our way to My Son Sanctuary, one of the most famous Champa architectural and sculptural monuments in Vietnam. Later this afternoon we make our way to Hoi An, visiting Marble Mountain and My Khe Beach (nicknamed China Beach by American GIs during the war) along the way. This evening we have the opportunity to explore the UNESCO World Heritage listed town of Hoi An. We commence our private cooking class at one of the most amazing locations in Hoi An. Included in the class is a brief introduction to Vietnamese food carving and plate decoration. After the lesson we will sit down and enjoy what we have just prepared for lunch. After lunch we will spend a little more time exploring Hoi An before we transfer to the airport for our flight to Saigon. Today we head off to Vung Tau and the former site of the 1st Australian Logistic Support (1ALSG) Group. Upon arrival we will enjoy a tour of this town including the former 1 ALSG base area, the War Memorial at Back Beach, the former Peter Badcoe Club site and the ‘Flags’ area. Early afternoon we make our way around the South China Sea coast to visit the former Minh Dam Secret Zone where we have the opportunity to meet a former Viet Cong officer. Following our visit we travel to the former Phuoc Tuy Province an area of operations for the 1st Australian Task Force (1 ATF) via Ba Ria and visit the former Nui Dat Task Force Base followed by a visit to the Long Phuoc Tunnels. Our final stop of the day is at the Long Tan Cross memorial, which will include a Commemorative Service to pay tribute to the men who fought and died in Vietnam. Today we begin our sightseeing around Vietnam’s largest and busiest city - but we do it ‘Amazing Race’ style. Teams will each be given a guide and will need to join forces in a team challenge of map reading, negotiating and interacting with locals and displaying creative communication skills whilst appreciating Saigon’s attractive sights like the Presidential Palace, The Central Post Office, Notre Dame Cathedral, and Ben Thanh Markets. Today we will explore Saigon, its society, unique culture and famous landmarks whilst engaging with one another and the locals at the same time. The final check in point will be at a local Vietnamese restaurant for lunch where a unique trophy will be awarded to the winning team! Later this afternoon we spend time at the War Remnants Museum where we will see countless artifacts, photographs and pictures documenting the tragic Vietnam War before making our way back to the hotel. Our farewell dinner this evening will be onboard a boat as we cruise along the Saigon River. Today we will set off for the Cu Chi tunnel system; a complex maze once home to Communist guerrillas in their wars against the Japanese, French, Americans (and Australians). Before entering the tunnels, we will watch a short introductory video (a great example of propaganda and one which History students could analyse particularly with respect to perspective, reliability and usefulness) and then explore Cu Chi. Also on display are various mantraps, the remains of an American tank as well as numerous bomb craters created by 500lb bombs dropped by B52 bombers. Dinner tonight will be at K.O.T.O restaurant. K.O.T.O, founded by Vietnamese Australian Jimmy Pham, is a non-profit organisation which is run by local children who Jimmy recruited from the streets. After breakfast we have time for some last minute shopping. Later this afternoon we transfer to the airport for our flight home. A Society and Culture tour is an excellent opportunity for students to gain exposure and hands-on learning in Vietnam and Cambodia—two of Asia’s most dynamic and rapidly changing countries. Students visit culturally rich areas such as Sapa and the Mekong where they immerse themselves in many facets of these unique areas. They don’t just hear from a guide about ancient ways of life, they see and experience it through direct learning about indigenous cultures. We also provide the opportunity to examine economic and social change within the cultural context of these vibrant countries. 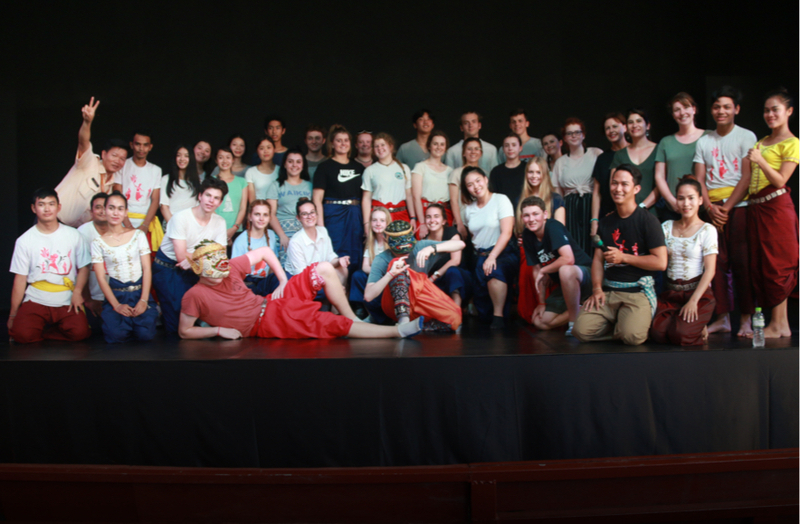 Through the Society and Culture tour, students develop an understanding and appreciation of society and culture in Vietnam both past and present. We depart home for our flight to Hanoi. Upon arrival we meet our guide and transfer to the hotel. Today we will venture out to explore Hanoi – not only the country’s capital but also the seat of culture and learning and the spiritual heart of the whole nation. First up this morning we will drive to the Ho Chi Minh complex where we will spend time at Ho Chi Minh's mausoleum, his former stilt-house, the Presidential Palace, the Ho Chi Minh Museum and One Pillar Pagoda. Later this afternoon, we will enjoy a 1 hour cyclo tour through the French inspired ‘old quarter’ before we take a glimpse of the cultural life and times of ancient Vietnam through a classic Water Puppet performance. Our next couple of days will be simply spectacular and will have us experiencing Vietnamese indigenous cultures and allow us to observe local music, dress and other crafts. First up today we will transfer to Sapa for a leisurely trek, where we will enjoy spectacular scenery as we head to the Y Linh Ho village of the Hmong people. After lunch, we head to the Muong Hoa Valley, on the way passing through the villages of Lao Chai and Ta Van where we will have a chance to meet with and explore the culture of the locals. Today we will also drop in to the Lao Chai Primary School to visit and interact with the students. Tonight we enjoy a homestay at one of the hill tribe villages. Homestays are a great way to get a feel for the culture and really understand more about the daily lives of the local people. A common saying is... 'you will arrive as a guest but leave as a friend'. This morning we will enjoy breakfast with our hosts before setting off to visit the Giang Ta Chai village of the Red Dao minority people. As part of today’s adventure, we will also trek through a bamboo forest and pass by a majestic waterfall; taking time to rest and enjoy the surroundings. After lunch we will continue toward Su Pan village where we start our journey back to Sapa by car. Spend the remainder of the afternoon at leisure in Sapa before returning to Lao Cai to board the overnight train back to Hanoi. Today we set off to the ‘Jewel in the Crown of Vietnam’; Halong Bay. We enjoy our overnight baot ride cruising amongst thousands of extraordinary limestone karst formations. After dinner we have the opportunity to try our hand at catching some squid with the friendly crew or entertaining our friends with a spot of karaoke before retiring to our room onboard for the night. This morning we watch the sun rise over the bay before we disembark and transfer back to Hanoi. Along the way we stop at Dong Trieu village to enjoy the most memorable time at Vietnam Eco Adventure. Our time at this quaint little village will allow us to experience a farmer’s traditional way of life and also gain a first-hand insight into the personal, social and cultural identity of the local people. While we are at Dong Trieu we will explore the village on the back of bikes before getting our hands dirty and having a go at farming using methods utilized by northern farmers for centuries. 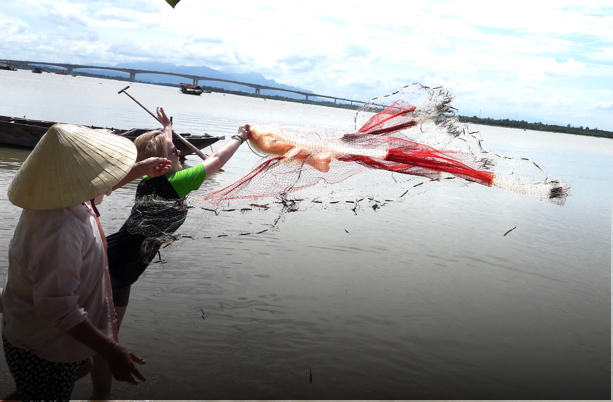 Our group will also have an opportunity to enjoy fishing and crabbing using traditional Vietnamese nets, boats and equipment. After lunch we will have the opportunity to talk with a resident of the village, a grandmother who has lived through and witnessed the turbulent history of Vietnam and the rapid societal change that has occurred, particularly in the last 5 years. Our discussion will shed light on a number of interesting topics including social institutions, the traditional family system and gender relations. First up today we will spend some time at the Museum of Ethnology which showcases the lives, cultural activities, and identities of Vietnam's 54 ethnic communities. Following this we will visit the infamous Hoa Loa Prison Museum. Hoa Loa is also known as the ‘’Hanoi Hilton’’ and was where former US presidential candidate John McCain was incarcerated for over 5 years. Early afternoon we embark on a Food Discovery Tour through Hanoi’s Old Quarter before we transfer to the airport for our flight to Saigon. Today we will spend time at the Cu Chi tunnel system; a complex maze once home to Communist guerrillas in their wars against the Japanese, French, Americans (and Australians). Our time at Cu Chi provides the foundation on which to understand the origins and consequences of war on Vietnamese society. Also on display are various mantraps, the remains of an American tank as well as numerous bomb craters created by 500lb bombs dropped by B52 bombers. This morning we have an early start as we head to the Mekong Delta. Our group will stop at workshops to watch century old techniques as the locals produce rice paper, coconut candy and fish sauce. Later this afternoon we will meet up with our home-stay family where we will help prepare the evening dinner before settling down for a night of festivities with our hosts. We will have a very early start this morning as we prepare to visit the famous Cai Be Floating Market. We watch the local farmers selling their produce from their boats at this amazingly colourful market right on the waters of the Mekong. Later this afternoon we transfer back to Saigon. Today we begin our sightseeing around Vietnam’s largest and busiest city - but we do it ‘Amazing Race’ style. Teams will each be given a guide and will need to join forces in a team challenge of map reading, negotiating and interacting with locals and displaying creative communication skills whilst appreciating Saigon’s attractive sights. This afternoon we will volunteer our time and help out at the Thien Phuoc orphanage, which houses approximately 65 children all of whom have a disability. This morning after breakfast we spend time at the Reunification Palace, The Ho Chi Minh Museum and the War Remnants Museum where we will see countless artifacts, photographs and pictures documenting the tragic Vietnam War. After lunch we should have some time for some last minute bargain hunting before transfering to the airport for our flight home. 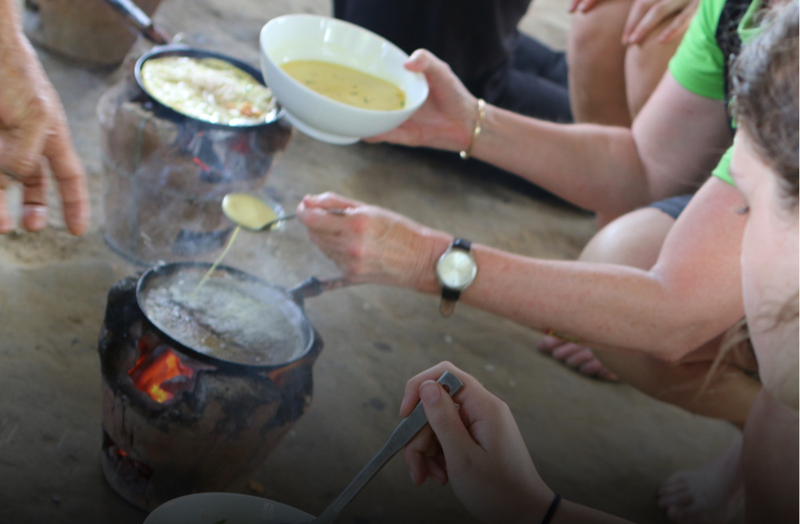 Learn the full story of food in Vietnam and Cambodia with a VST Food Tech Tour. Students learn how the history of Vietnam and Cambodia has influenced its food throughout the years while enjoying its exquisite cuisine. This is a very hands-on tour where students and teachers participate in many direct cooking experiences. There’s something very special about cooking alongside others, sharing in the flavours and traditions of another culture. From paddock to plate, we provide a truly authentic experience of the amazing foods from these countries. We arrive today in Hue, the former cultural and religious center of Imperial Vietnam, we will be met by our guide and transferred to the hotel. This morning we will wake early and take a walking tour to the largest wholesale market in central Vietnam – Dong Ba. Everything here is so fresh and the market is an absolute hive of activity. After our market tour we will stop and enjoy a bowl of the Hue’s regional specialty Bun Bo Hue – your senses will ignite with this dish that is salty, sweet and spicy all at the same time! Once the last remnants of our soup has been slurped up we will head back to the hotel for showers and some of the hotels buffet breakfast for those who are still hungry. We will then hop onboard our cyclo’s (one of the most relaxing ways to witness daily life is from a cyclo) right from the hotel and set off for the Ancient Imperial Citadel of Hue. Built as a walled fortress and palace, the citadel was in the old days closed to outsiders and posed many mysteries. In the innermost forbidden purple city lived the Ancient kings and queens of Vietnam. Visiting the Imperial Citadel, you will be astonished by the impressive architecture and luxurious lifestyle of its former residents. Our lunch today will be at Dong Tien Pagoda and will be a local vegetarian specialty as prepared by the nuns. The pagoda is also an orphanage and the nuns do an amazing job caring for the children. As such we will also have the opportunity to interact and play with the children – bringing some light into their day. After lunch we will enjoy a majestic boat trip down the perfume river followed by a visit to a local shop that specializes in making local candy and cookies and will be able to try our hand at this age old craft. Tonight will see us dining on traditional royal cuisine while dressed in the clothing of the kings and queens of Hue’s royal past. Good food, good company and the most memorable time. This morning we farewell Hue and transfer by bus to Hoi An, travelling along the high pass of Hai Van (enjoying spectacular views of the Pacific Ocean) and also visiting Marble Mountain and My Khe Beach (nicknamed China Beach by American GIs during the war) along the way. Upon arrival we check into our hotel to have a rest and freshen up. This evening we have the opportunity to explore the UNESCO World Heritage listed town of Hoi An. With its Japanese arched bridges, French wooden shutters and Chinese pagodas - Hoi An showcases all of its foreign trader past without having lost its unique Vietnamese identity. Simply breathtaking. We will enjoy a cooking class with Red Bridge Cooking School. Our class will also include a visit to Hoi An’s colourful market, a boat trip along the Thu Bon river and an introduction to Vietnamese food carving. After lunch (which will be the fabulous fare we cooked up at Red Bridge) we will enjoy a cycling trip to Cam Nam Village witnessing local river life along the way. Tonight we will have some free time in Hoi An town after dinner to experience all that this amazing little town has to offer, we will also have time to browse Hoi An’s colourful night markets. After lunch we will board our boat for a river cruise. Here we will enjoy a hands-on experience of traditional net fishing before we sit down to listen to a former combatant from the war re-tell some of the most amazing stories. Today we are in for a very special treat as we will join Neville Dean, a good friend of Tram’s and her brother’s Anh Do, on his best-selling food tour through Hoi An. Rising to prominence after being featured in Anh’s television special ‘Anh Does Vietnam’ Neville now runs a daily tour that was recently named one of the world’s 15 fabulous Food Tours by National Geographic’s traveler magazine – and as guests of Tram’s and VST you will be in for a really, really special time! After lunch today we will have an afternoon at leisure. Some might choose to enjoy a pastry and cafe sua da at one of Hoi An’s many bakeries, others may finalise clothing items they had tailored earlier in the week or we may all choose to kick back and relax by the edge of the hotel’s pool. Today we have an early start, driving to the airport for our flight to Nha Trang. After stopping by our hotel we will undertake a cooking class that specializes in regional specialty dishes unique to Nha Trang. This afternoon we spend time with the orphanage that we support as a school (school to provide more details here). Today we have an early start and will spend time at Vinh Truong Fish Market watching the frenetic pace as fishermen sell their catch that they netted overnight. Afterwards we will visit the local fruit and vegetable market before returning to the hotel for a later breakfast and a rest before heading off for our afternoon flight to Saigon. This evening before dinner we will embark on a leisurely orientation tour of Vietnam’s most populous city. Stopping by Notre Dame Cathedral and the Old Post Office our group will be amazed at the mass of motorcycles and scooters buzzing around. After dinner we will take a stroll along Saigon’s first pedestrian only street and absolute hive of activity Nguyen Hue Boulevard. This morning we spend time at the Reunification Palace (the former Presidential Palace of the President of South of Vietnam), the War Remnants Museum (where we will see countless artifacts, photographs and pictures documenting the tragic Vietnam War) and Cholon, Vietnam’s largest Chinatown, with roots dating back to 1778. This morning we have an early start as we head to the Mekong Delta. Often dubbed the "rice bowl" of Vietnam, this 39,000-square-kilometre labyrinth of waterways remains one of the most densely populated parts of the country. Our group will stop at workshops to watch century old techniques as the locals produce rice paper, coconut candy and fish sauce. After lunch we continue to explore the Mekong on the back of a bicycle. As we cycle along village paths we will be able to chat to the local farmers and witness them at work. Later this afternoon we will meet up with our home-stay family where we will be guided and will help prepare the evening dinner before settling down for a night of festivities with our hosts. We will have a very early start this morning as we prepare to visit the famous Cai Be Floating Market. We are certainly in for an amazing experience as we watch the local farmers selling their produce from their boats at this amazingly colourful market right on the waters of the Mekong. Later this afternoon we transfer back to Saigon. Early afternoon we transfer back to Saigon and will enjoy some time shopping for a bargain at Ben Thanh Markets. Tonight we will enjoy a Saigon River Dinner Cruise. We will spend two hours cruising, reflecting and watching some great live entertainment as we sail down the Saigon River. We will have a later start today before we enjoy some last minute bargain hunting at some of Saigon’s best spots. After lunch we will transfer to the airport for our flight home. Come explore the rich history of Vietnamese art, along with art from some of the current leading artists in Asia on our VST Art tours. Students explore Vietnam’s history and culture through the lives and works of its artists—from thousands of years ago to the present day. We look at the influence of other cultures on art in Vietnam, and common themes that can be traced back to the Bronze Age. Inspire your group with our carefully planned tours of private collections, museums, and contemporary art spaces. Each art tour is designed to provide exposure to many artists and mediums in a variety of settings throughout the country. Upon arrival into Hanoi we will be met by our friendly guide and transferred to the hotel. Today we venture out to explore Hanoi. First up we drive to the Ho Chi Minh complex where we will spend time at Ho Chi Minh's mausoleum, his former stilt-house, the Presidential Palace, the Ho Chi Minh Museum and One Pillar Pagoda. Following our tour we make our way to a Fine Art Museum as well as stop at Hang Bong Street which is famous for it’s propaganda art shops. After lunch we visit an art gallery where we will have the opportunity to meet some of the artists who will discuss their techniques and mediums used. We then continue onto the Temple of Literature where we sit down to our own private art lesson. A local artist will guide us through as we produce our own piece of Vietnamese art to take home. Later this afternoon, we enjoy a 1 hour cyclo tour of the French inspired "old quarter" before making our way to dinner. Tonight after dinner we sit down to enjoy a performance of the city’s famous Water Puppets. The water puppet is a tradition which dates back to the 11th century. Though now performed in a pool of water, the water puppets were traditionally performed in the rice paddies when the rice fields would flood as a form of entertainment. The puppets however are still hand-made the traditional way out of wood and lacquered often with exquisite detailing. Today we set off to the ‘Jewel in the Crown of Vietnam’; Halong Bay. Arriving before lunch we will board our private boat and then set sail, cruising amongst thousands of extraordinary limestone karst formations. Halong Bay was voted one of ‘The New7Wonders of Nature’ in 2011, and once here you will know why it was included in this group. Later this afternoon we make our way back to the buses and return to Hanoi. This morning after breakfast we make our way to a traditional wood carving village to observe the skilled craftsman. A lot of the techniques and tools have been handed down from generation to generation. Students will have the opportunity to see the different stages as well as chat to some of the craftsmen. We then make our way to a traditional silk weaving village which has specialized in silk production since the 18th century. Van Phuc Village is known for providing the best silk in Vietnam with it’s silk used for royalty during the Nguyen Dynasty Period. Silk from this village is now widely known and exported to many countries all over the world. Following our lunch today, we visit a ceramic village where we will not only get a chance to see the artisans at work but also have the opportunity to sit down and create a piece of pottery to take home. This morning we venture out on a food exploration tour and discover why Vietnam is so well known for its amazing cuisine. Enjoy visiting vendors and markets, some hidden away in back alleyways yet all producing the most delicious food. Explore this cuisine which uses an abundance of fresh herbs and vegetables and uses meat as a condiment rather than a main meal. Discover why Vietnamese food is regularly described as 'healthy yet delicious'. Later this afternoon we make our way to the airport for our short flight to Danang. Upon arrival we visit the Cham Sculpture Museum. Housing over 300 exhibits dating back from the 5th – 15th century, the museum holds the world’s largest and most extensive collection of sculptures from this civilization which occupied southern and central Vietnam up until the early 19th century. This morning as we wake up in Hoi An we will commence our cooking class. The cooking lesson runs for about 2 hours with each dish first being demonstrated before we prepare the same dish ourselves. Included in the class is a brief introduction to Vietnamese food carving and plate decoration. The Vietnamese see vegetable carving as an art form itself, creating beautiful objects such as flowers and birds which are used as a garnish for dishes. After the lesson we will sit down and enjoy what we have just prepared for lunch. This afternoon we enjoy a walking tour through the World Heritage listed town of Hoi An. Often featured in newspapers and travelling shows, this small quiet town is now a very popular spot to visit. Hoi An is known for its excellent food, interesting architecture and countless tailors. We have an early start this morning as we head off to our Farming & Fishing Life Eco Tour. Starting at Tra Que Village, we will get a personal insight into the local farming communities. We set about joining the farmers in preparing their land for sowing, helping to fertilize the garden using seaweed from the local river and watering it in using huge tin cans strapped to our backs. Following this, we will begin our leisurely cycling tour through the countryside witnessing local Vietnamese rural life first hand. Late morning we board our Hoi An Eco-tour boat for a river cruise. Here we meet and witness local fishermen working their craft, before enjoying a hands-on experience of traditional net fishing. We then transfer to a Vietnamese bamboo basket boat for a quick race and ride down a coconut palm lined waterway. Whilst onboard our boat our host will explain the history of the bamboo basket boat as well as its construction techniques and materials, which are all locally found and readily available. Lunch today, is on board our boat which is prepared using vegetables picked earlier at Tra Que Village. After lunch we make our way into Hoi An and partake in a lantern making class. Hoi An is famous for its silk lanterns and a trip to the night markets or simply into town on any given night will have students and teachers mesmerized and enchanted by the amazing colours and designs of the silk lanterns which is used to light up the streets. This morning after breakfast we will depart early for our trip to Hue. Hue is home to the Hue College of Arts and is often frequented by those enthusiastic about art and history. Upon arrival we visit the Ming Mang Tomb, the Ancient Citadel and also the Thien Mu Pagoda, which built in 1601 is one of the oldest and prettiest religious buildings in the country. Here we can view and appreciate the intricacies of the building and its carvings which were all hand carved centuries ago. Later this afternoon we make our way to a local art gallery. Galleries here often display works of upcoming artists or graduates from the local university. Students will be able to see the difference between galleries exhibiting works from artists whose techniques have been passed down through the family and works of those who have been taught more modern techniques at the university. Tonight we enjoy the aesthetically presented cuisine of Hue, which is often regarded as the best in the country, creating a meal for the eyes as well as the stomach. Today we transfer to the airport for a short flight to Saigon. Upon arrival we will set off for the Cu Chi tunnel system; a complex maze once home to Communist guerrillas in their wars against the Japanese, French, Americans (and Australians). Before entering the tunnels, we will watch a short introductory video and then explore Cu Chi. Also on display are various mantraps, the remains of an American tank as well as numerous bomb craters created by 500lb bombs dropped by B52 bombers. Later this afternoon we head back to Saigon to freshen up for dinner. This morning we begin our sightseeing around Vietnam’s largest and busiest city. We will start with the imposing Notre Dame Cathedral which was built between 1886-1890 and the French style Central Post Office which was designed and constructed by Gustave Eiffel who is better known for his work on the Eiffel Tower. We will then visit the former Presidential Palace and War Remnants Museum. We then spend some time shopping in Saigon, the Ben Thanh Market will be one of the stops in our quest to snap up some bargains. Later this afternoon we explore the Ho Chi Minh City Fine Arts Museum. 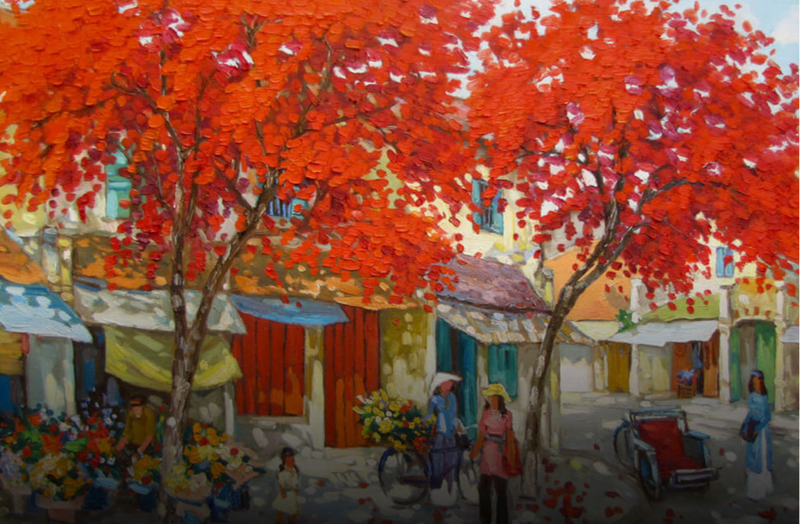 Here we will see a varied collection of works by Vietnamese artists, both historical and contemporary. Following our tour we take a short stroll to Dong Khoi St to browse the many art galleries, many of which are small single roomed shops crammed with artworks from floor to ceiling often with the artist inside working on another piece to add to their collection. After breakfast this morning we make our way to Thien Phuoc orphanage which houses approximately 65 children all of whom have a disability. Some of the children are orphans while others could not be cared for by family members due to lack of finance and facilities at home. The children are cared for by a group of nuns who have dedicated their lives to these children. We will volunteer and help with such things as meal times (this can take up to 3 hours) and simply visit and interact with the children. Later this afternoon, we make our way to the airport for our journey home.